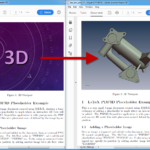 “3D PDF” is a generic descriptive term for a Portable Document Format (PDF) file containing 3D annotations, which may be viewed using Adobe Acrobat, or other 3D PDF rendering and typesetting software. “PDF3D” is a product name and registered trademark of Visual Technology Services Ltd. Visual Technology Services was established in 2003. PDF3D was first released in 2006 with the launch of the PDF3D SDK for 3D PDF document generation. The SDK used the Universal 3D (U3D) encoding of 3D geometric models in 3D views within a PDF page. In 2009, the PDF3D ReportGen desktop application was added, operating as file converter to produce 3D PDFs from various 3D model file formats. In 2010, the PRC data structure encoding was added as an alternative to U3D, providing improved file compression and functional enhancements. The 2014-2015 period releases of PDF3D included 3D Geospatial Coordinate features. PDF3D software components are licensed and integrated into many third party 3D applications. PDF3D software is used in CAD, Manufacturing, Engineering, Earth Sciences, Medicine, Architecture, Construction, Survey and Geospatial domains for collaboration and reporting. Categories: PDF software, 3D graphics software, 3D computer graphics, software for Linux, Proprietary commercial software for Linux.